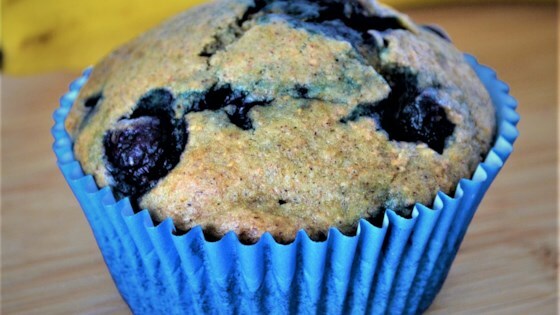 "Beautifully soft on the inside with a slight crunch to the outside, these muffins beat traditional blueberry muffins and have the added deliciousness of banana. Especially great served warm and straight out of the oven! Best eaten a day or two after they're made though they will store for 3 days in an airtight container. Totally addictive and very much lactose free so they're easy to digest!" Preheat oven to 375 degrees F (190 degrees C). Grease 18 muffin cups with oil or line cups with paper liners. Sift all-purpose flour, self-rising flour, baking powder, cinnamon, and salt together into a small bowl. Sift the flour mixture again into a larger bowl; stir in brown sugar and white sugar. Make a well in the centre of the flour mixture. Lightly beat eggs with the vanilla extract in a bowl. Add milk and whisk until well combined. Whisk in vegetable oil in a slow stream. Mash bananas well with a fork; fold in until thoroughly combined. Pour egg-banana mixture into the well of the flour mixture in a slow stream, stirring to combine using a metal spoon. Stir the mixture until just combined. Fold in blueberries. Spoon batter into the prepared muffin cups, filling each 3/4 full. Bake in the preheated oven until tops spring back when lightly pressed and a skewer inserted in the centre comes out clean, about 30 minutes. Allow muffins to stand in the cups for 3 to 5 minutes before turning them out on to a wire rack to cool. Soft, moist, sweet, and fluffy banana muffins! You can also use a lactose-free margarine (such as Nuttelex®) to grease the muffin tin. Apple juice or soy milk can be substituted for the lactose-free milk.